My friend Opal introduced me to Zentangle ® in 2011. I’ve just completed my CZT training in Rhode Island in CZT #20, June, 2015 – What an amazing experience! I’ve had a few people ask me how to get started with Zentangle , so I decided to make a page with some links to get you going. There is a LOT of information out there, so this is a starting point to weed through all the many options. These are my most used references as well. 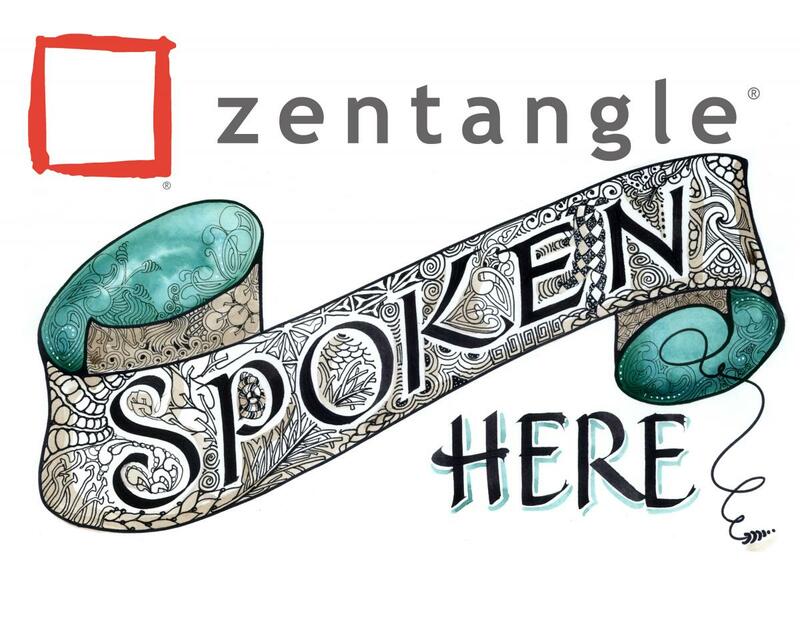 That’s where you’ll find out everything you need to know about what a Zentangle is (and isn’t) who started that particular method etc. You can also get supplies there and see what’s going on by subscribing to the newsletter. Most importantly, you can click on the “Learn More” link and find a CZT in your area and take a class! Tangles are easy enough to find by doing a quick search on Google. Pinterest is a wonderful resource for tangles as well. Another place I love to visit and find patterns is Sandra Straits Blog, Life Imitates Doodles. She rounds up all the patterns that pop up weekly, not just the patterns that are accepted over at Tanglepatterns.com She also has a great Flickr.com Group called Freehand Doodle Patterns that you should check out. Genevieve Crabe of Tangle Harmony does a really wonderful Weekly Roundup where she lists all the new goings on for the week. I highly recommend The Book of Zentangle by Rick Roberts and Maria Thomas. There are plenty of books on Zentangle at Amazon.com, but be aware that not all of these books are about the Zentangle Method. Some of my favorites are by Sandy Steen Bartholomew and Suzanne McNeill. I started with Totally Tangled, Yoga for your Brain. I think I probably have every book these two talented ladies have put out – well worth it! You can also find books on Zentangle at Michaels and I’ve heard Hobby Lobby is also carrying them. These ladies both have blogs – Sandy’s is here and Suzanne’s is here. Starting with the simple basics – a pen, a pencil, Zentangle Tile or if that’s not available a small piece of paper – you don’t need much, but using quality materials is so much nicer and you can also find those on the Zentangle site. You can read a description of the process here. There are also fun weekly activities you can participate in, my favorite being the Weekly Challenge by I am the Diva. Have a look and give it a try. I run a group on FB, For the Love of Tangling where we have monthly challenges, videos, tons of resources and links to help you on your journey, so come on over and join us. Along with Zentangle, I also have done quite a bit of Zentangle Inspired Art (ZIA). There are days I sit and make a tile and there are days I want to create something Zentangle Inspired. I’ve done some really fun projects using templates from Ben Kwok. He has a wonderful group on Facebook called Ornation Creation. He creates beautiful templates for anyone to use and fill in however they like. It’s a great group, no drama, I highly recommend joining this one. Another great resource for how to draw patterns is Youtube.com. I’ve recently started my own Youtube Channel with lots of info, techniques and demonstrations of my tangle patterns – have a look and subscribe. You can simply do a search on Zentangle but one of my go-to channels is Ellen Wolters – she has a lot of video’s that are very good. Once you watch a few of her video’s you’ll see that there is nothing fancy-pants involved in drawing the patterns – they are done in steps, are made up of lines and if you take it step by step anyone can do it. Practice of course makes better (I won’t say perfect, that’s too much pressure). When I started intentionally using these patterns my spirals where not very spirally…I think they’re better now. My lines can be wobbly, but overall, the more you do, the better if feels and looks. Don’t get hung up on being perfect, that’s not what this is about. Just take it line by line. Pinterest is another great place to find patterns, see art and get inspired. I have quite a collection of patterns on my Tangle Pattern board. You can also see a lot of Ellen Wolters video’s pinned over there and watch them from within Pinterest. Since I travel from time to time, I’ve been looking for a way to take pattern references with me, but not lug my entire library around – I’ve been using Evernote to make an ongoing library of patterns. You can access what you’ve got there from mulitple devices and I’m sure it will come in handy where ever I go that internet is available. Just keep in mind, when you are collecting patterns out there, be respectful of the artists that went to the trouble to draw out their instructions – copyright is a much discussed subject but I feel that anything anyone has drawn out instructions for is theirs. Do you have to mention every pattern you use, give credit to the “creator” – not neccessarily, but it’s a nice thing to do if you can. I’m not at all saying you can’t draw the pattern, put it in your work, sell your work etc. But if you duplicate their specific INSTRUCTIONS/STEP OUTS without their permission to distribute them or sell them, that’s a big no-no. You can see Tanglepatterns.com notice here. Most say they are for your personal use and reference, so putting them in your own file for your own reference is what they’re talking about. Yes patterns have been around, in nature, in the world forever. That’s not what this refers to. Give that link a quick read to broaden your understanding. There are a few App’s as well – There is Tangle Library which is a collection of Sandy Steen Bartholomew’s patterns from Yoga for your Brain – it has a few in app purchases that have expanded it. There is also an app called Doodle-Patterns which also has in app purchases for expansions. I have both of these and as a matter of fact, my pattern, Archer is included on the Doodle-Pattern app. They’re both really great ways to take a lot of patterns with you. I usually have a bunch of Zentangle Tiles with me and at least one sketchpad (right now there are three in my work bag) you never know when you’ll get a minute. Have fun learning about Zentangle. I’ve had people tell me they can’t draw, then try this and become amazed that they’ve created something beautiful. If you can find a class in your area, definitely give it a go. For a list of CZT’s (Certified Zentangle Teachers) check Here. And I’m really excited to say that I’m now on this list, so if you are in the Northwest New Jersey area and looking for a Class/Lesson contact me!